Titan West Inc. equipment is designed for cattle. Our equipment is constructed of heavy gauge square tubing and sheet steel. This equipment has been designed with safety benefits for both the operator as well as the cattle. Our equipment is flexible, with a large number of possible configurations available. 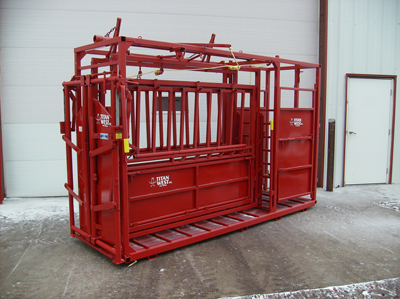 We will custom manufacture our equipment to fit your corrals, buildings, or handling practices. Titan West can design and build complete corral systems. Titan West’s working chute is one of the strongest working chutes available today. Adjust From 9" To 30"
There is no need to hire extra help with this system. Your regular crew can handle the job easily, safely, and in less time than ever before. Click for brochure. Our continuous fence is one of the most unique, and one of the strongest on the market today. Standard length is twenty feet but we can custom make any length up to twenty feet . Click for Brochure. Sets up in 10 minutes - 3 sizes from 50 cows up to 200 cows.